A classic greenhouse design – span-roof greenhouse EcoSlider EH. 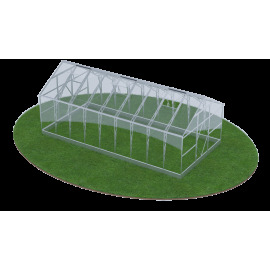 It is a rectangular greenhouse with vertical walls and span-roof. Main benefits of this greenhouse are: increased planting area, excellent lighting, convenient access to plants. Span-roof ensures sufficient structure height, especially in the middle, where the owner of the greenhouse usually is moving. Foundation of the EcoSlider EH is made of special reinforced beams with internal weaving that adds extra durability. Both greenhouse ends are equipped with large doors with big vent windows. This greenhouse model is available with standard 4 mm thick polycarbonate cover, or with 6 mm, 8 mm or 10 mm thick polycarbonate cover, which will make the greenhouse much more resistant to large snow loads. There is no need to remove snow from the roof of the greenhouse in winter. EcoSlider EH assembly modules are made in standard length of 2.1 m, allowing to extend the greenhouse by purchasing additional modules. If necessary, the greenhouse can be moved from one location to another - no disassembly required. Don't forget to tightly fix the greenhouse to the ground in the new spot. Customers also have an option to install automatic mechanisms for opening vents in the roof.